Do	you have more cardboard than can fit into your recycling cart? 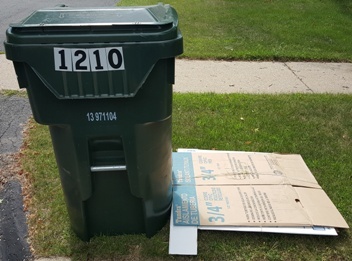 It's a common problem in this age of online shopping, and the Streets Division has two simple ways to get your cardboard recycled. 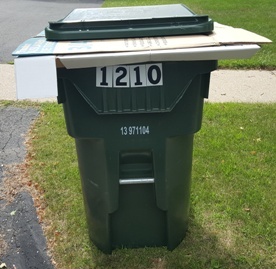 City of Madison residents and taxpayers can bring all the cardboard that does not fit into their recycling cart to one of the drop-off sites. The drop-off sites are located at 1501 W. Badger Rd (at the back of the deadend on W. Badger) or 4602 Sycamore Ave (across from the Sycamore Park dog park). The drop-off sites hours change seasonally, so be sure they are open before loading your vehicle and arriving at the site. All drop-off site restrictions apply. Streets Division crews will collect excess cardboard at the curb on your scheduled recycling day, but you must follow these steps. Also, you should be mindful of the weather before setting excess cardboard out on your recycling day. Rain and snow will damage cardboard and could prevent it from being recycled, and high winds could blow it away. Step 1: Flatten all the boxes that do not fit into the cart. Do not place flattened boxes into a larger box. 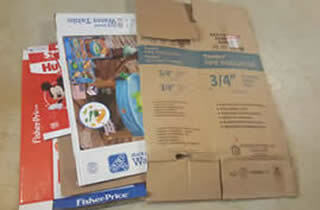 Step 2: If necessary, cut or fold the excess cardboard down into roughly 3' x 3' squares. Step 3: Bundle all the loose cardboard together using string or twine. The bundles should not be taller than 6 inches. Cardboard set out differently than detailed above may not be collected. These guidelines are in place because Streets Division operators will need to collect the cardboard outside the cart by hand in many cases. The bundles of cardboard must be easily manageable so the operator can exit their truck then safely lift the bundles in order to get them into the recycling truck. Recycling cardboard is a fantastic option. However, there may be other options available to you. Perhaps donating boxes to a church or community organization or thrift store or private box exhange. Community centers, schools, or libraries may need them for art projects. Maybe even post to your neighborhood's Facebook page to see if anyone needs boxes for a move or a project. Recycling them is easy, but if you prefer, with a little creativity and detective work, you may be able to find an alternate way to reuse or recycle them. (608)266-4681 if you live west of S. Park Street.